Emerald Claddagh Ring. One can't help but adore the beautiful Irish craftsmanship. 9K Gold CZ Emerald Claddagh Ring with Cubic Zirconia Halo. One can’t help but adore the beautiful Irish craftsmanship. This Emerald Claddagh Ring has a Emerald stone set as Heart and further improved with Cubic Zirconia halo surround of Cubic Zirconia stones. This Ring further decorate the idea to bring out the beauty and sparkle in Claddagh Rings design. Whatever the occasion, this Ring makes a perfect Irish Jewelry gift. One can’t help but adore the beautiful Irish craftsmanship., this Ladies Cubic Zirconia Ring crafted from 9K Gold in Ireland. Hallmarked in Dublin Assay office, this Claddagh, heart encircled and pair of delicate hands with a crown above the heart. The hands of the Claddagh symbolize friendship, the heart love, and the crown loyalty. Also the Claddagh has a rich Irish heritage will surely be endured and appreciated for years to come. 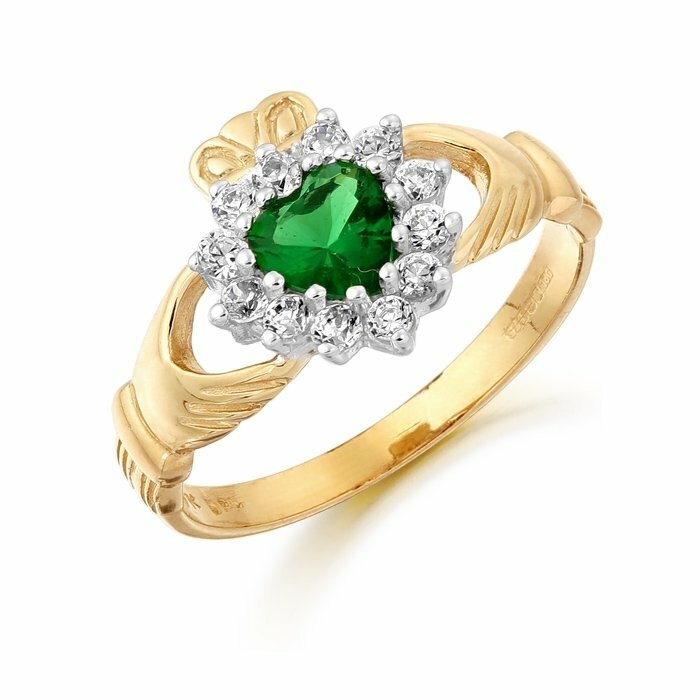 Also enjoy the quality of professional masterpiece and feel confident in your unique and stylish Claddagh designer Ring. Finally, take advantage of our Free Worldwide delivery and unbeatable prices.